Members – and prospective members – go through a journey from awareness to engagement. This is equally true for the journey of becoming a member, attending an event, or deciding to volunteer on a committee. One of the key roles for leadership (and the board) is to examine how that journey can be helped along – and made more efficient. In this white paper, we examine the underlying keys to using digital on these journeys, and specifically for improving member recruitment, retention, and engagement. Perhaps unsurprisingly, technology is only one ingredient – and not even the most important: strategy and content are. We unpack these with one of the more profound – and easy-to-understand – concepts, the Relationship Curve. Despite the promise of Social Media, has it really helped your association compete in the marketplace of ideas? Have members suddenly decided that a computer – not a professional community – is how they will succeed? And has your association unwittingly become overburdened by “investing” in Social Media activities, with little-or-no return on investment? Today’s associations are faced with many challenges: Cost pressures. Heightened competition from non-traditional sources. Changes at the intersection of marketing and technology. And perhaps, older marketing strategies that might benefit from a new perspective. In the 1940s, marketing was characterized by individual relationships built at the monthly chapter meeting and annual convention. In the 1950s, marketing was revolutionized by the 4P marketing framework. The levers of price, product, promotion, and place could be used to precisely “position” an organization’s offerings. While 4Ps are foundational, there is a fundamental missing link within this equation: where is the target member? It seems almost ridiculous to not have this fifth P – the target “Person” – absent from the mix. And even more importantly, why does the 4P framework not speak to what you want the target to actually do as a result of the marketing stimulus? Enter the Relationship Curve™, a directional marketing model that precisely targets these gaps. Here’s how it works: The relationship curve posits that with the appropriate stimulus, relationships will improve over time. 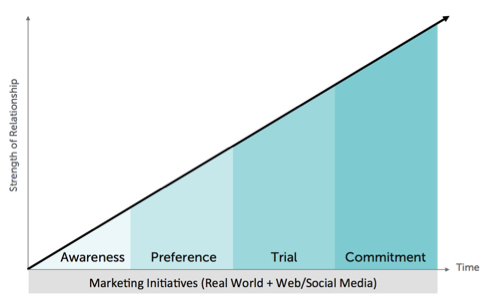 Targets (whether they be prospective members, prospective sponsors, or prospective job candidates) move along the relationship curve through the four stages of Awareness, Preference, Trial, and Commitment. 1) Awareness: The target is aware of their problem, and aware of your organization. 2) Preference: The target has surveyed the marketplace, and they prefer your offering over any alternatives. But they are not sure. 3) Trial: They have had an opportunity to test-drive an experience with your organization, and have satisfied themselves that engagement with you can solve their problem. At an emotional level, there is alignment between their brand and yours. 4) Commitment: They complete the transaction. This can mean joining, signing up for an event, or agreeing to a particular course of action, such as serving on a committee. How might this actually be executed? How can your organization use this concept to reduce marketing opportunism and improve the marketing outcome? And how does Social Media fit into the mix?